Roughly chop parsley. Finely dice chili. Cut cabbage and onions into fine strips. 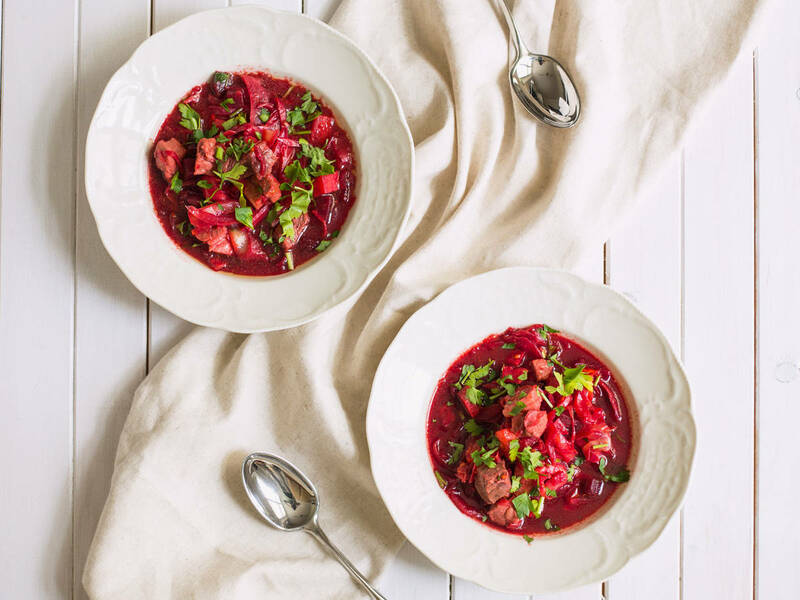 Cut beets, carrots, tomatoes, and celery root into bite-sized pieces. Cut pork and beef into large cubes. In a large saucepan, bring water, beef, and pork to a boil. Then, reduce heat to low and skim foam from the surface. Next, add bay leaves, salt, and pepper and simmer for approx. 25 - 30 min. In another large saucepan, sauté carrots, beets, cabbage, onion, chili, and celery root in some vegetable oil over medium heat for approx. 5 - 7 min. until tender. Deglaze pan with beet juice and allow to reduce for approx. 15 - 20 min. Strain the pork and beef stock and set the meat aside. Add stock to the pan and allow to reduce for approx. 10 - 15 min. Add meat, allspice, and tomatoes to the borscht. Stir well to incorporate. Add parsley and red wine vinegar. Stir well to incorporate. Enjoy with a dollop of sour cream, if desired.